While the National Security Agency should still be of concern to citizens when it comes to indiscriminate massive surveillance, there is another agency or department in the United States government that has far more potential to specifically intrude upon the lives of citizens. That department is the Department of Homeland Security, which offers federal funds to local law enforcement agencies to expand surveillance capabilities. Nadia Kayyali, an activist for the Electronic Frontier Foundation who spoke at the South by Southwest conference this past week, has been working with EFF and other groups in Oakland to prevent a proposed Domain Awareness Center (DAC) from expanding further into the city. “Phase 1 had already been built and this was most of the port systems and then also some of the surveillance cameras in the city of Oakland,” Kayyali recounted. “Phase 2 was to continue with the build out and [to] integrate some other systems.” What happened at a City Council meeting on March 4th is that the council voted to move forward with Phase 2 but “voted to remove the city cameras from the Domain Awareness Center,” a victory in the continued effort to contain and oppose the construction of this spy center. “Oakland does not have a good record as far as law enforcement goes. Surveillance and just in general any authority that the police department has, people have a really good reason to be suspicious,” Kayyali added. Kayyali joins Rania Khalek of the “Dispatches from the Underclass” blog for an interview on the proposed DAC. Activists and resident groups seem to have stopped it from metastasizing into the city. It will only monitor the area in and around the Port of Oakland. Yet, like any surveillance project, it could easily grow and Kayyali highlights want citizens in other cities should be doing to fight these DHS-funded projects. For more information on the planned project and the effort to stop it, here’s an excellent wiki addressing various aspects of it . Many of the organizations that came together to challenge this project are listed here. During the discussion portion of the show, Gosztola and Khalek talk about the latest bombing of Gaza from Israel, the six US drone strikes in Yemen this month, corrupt prosecutors in the Justice Department, what happened when the US was confronted on its human rights record by a UN panel this past week and how the CIA has fought the Senate because it doesn’t want the fact that torture was official policy to become undisputed. KEVIN GOSZTOLA, Firedoglake.com: It’s highly likely that many of our listeners could be unfamiliar with this [spy] center that was proposed in Oakland and has been being developed. Can you explain what it is and what it could have been because I know that there has been some setbacks for people trying to develop it? NADIA KAYYALI, EFF: The Domain Awareness Center started as Department of Homeland Security project at the Port of Oakland. It really was intended to address port security issues. 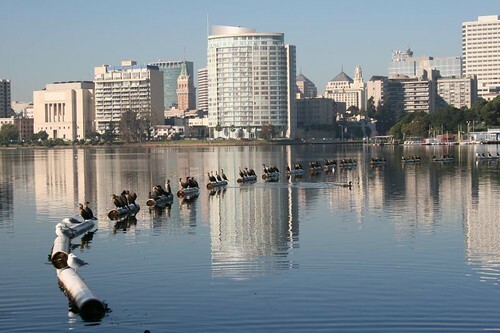 We’re not really sure when—It appears that in approximately 2010 that a decision was made to extend the security project to the entire city of Oakland. What the Domain Awareness Center does is it takes PSIM—This is a type of software that takes various surveillance technology and puts it all into one user interface. If you can imagine a big screen that has sources coming from traffic cameras, cameras at the edge of ports, ShotSpotter, which is a system in Oakland that detects gun shots, computer automated dispatch for 911—All these different sources of information, they’re all put into one system, and so it’s very easy for one or even two people to use this system to have pretty accurate picture of what’s going on at the ports and at one point, as we’ll talk more, was the entire city. GOSZTOLA: Can you talk about what happened on March 4 at the city council meeting? I know there’s been activism in Oakland, and did that play a key in this City Council meeting? KAYYALI: Absolutely, the activism is key. I really think that what happened with the Domain Awareness Center is a perfect example of grassroots organizing and also privacy advocates stepping up to the plate. March 4th at the City Council was just the last in a long series of meetings that dozens and sometimes hundreds of activists showed up at. And March 4th was the last vote that the city council had and this vote was to decide whether to give the city manager the ability to enter contracts to build Phase 2 of the Domain Awareness Center. So, Phase 1 had already been built and this was most of port systems and then also some of the surveillance cameras in the city of Oakland. Phase 2 was to continue with build out and integrate some other systems. And what happened at the March 4th meeting is that the council did vote to go forward with Phase 2 but it also voted to remove the city cameras from the Domain Awareness Center. Just to get some context on that, the city staff gave the City Council an estimate of costs because this was built with Department of Homeland Security funds so the City Council is actually having to pay money back to the Department of Homeland Security to take these cameras out. And when you think about how excited local governments to get what they view as free money from the federal government, this is a huge win. There’s still more to do with the Domain Awareness Center, and we would have liked to see a “no” vote. But there’s no question that this is an improvement over a citywide Domain Awareness Center. GOSZTOLA: Just to establish some facts I’m going to read from something you wrote for the Electronic Frontier Foundation about what this could’ve been. You put up this piece, “EFF Submits Letter Opposing Oakland’s Domain Awareness Center,” and it noted that “35 CCTV cameras, 40 live video surveillance cameras, 25 traffic camera sites, license plate readers, and Oakland’s “[gun]shot spotter” system,” were part of the proposed project. There are many organizations that rejected this and were actively involved in opposing the proposed project. Can you address recent history in Oakland, maybe related to law enforcement and surveillance that made people particularly wary about allowing this to proceed? KAYYALI: As some of your listeners probably know, Oakland does not have a good record as far as law enforcement goes. Surveillance and just in general any authority that the police department has, people have a really good reason to be suspicious. The Oakland Police Department is currently in active litigation. It was sued for the vigilantes actions by some Oakland police officers that happened in 2003. This is a large civil rights lawsuit. And then also at the same time the Oakland Police Department has been sued for its use of so-called less lethal weapons. And, in fact, one of those lawsuits arose out of actions at the Port. This was a protest in 2003 against the war and Oakland Police Department used wooden dowels and severely injured protesters. There was a lawsuit and there were crowd control measures that Oakland Police Department came up with with the ACLU and the National Lawyers Guild, which they to-date have not followed. In all the Occupy protests, the images of what was going on in Oakland, people saw them around the country. And the Oakland Police Department absolutely did not follow their crowd control measures. Those are some examples of just bad faith on the part of the police department and also misuse of technology. There are concerns about use of license plate readers and then also just recently there is discussion about the use of StingRay technology, and this is technology that oftentimes without a warrant is used to get location of cellphones. So, there is just a lot of concern with giving a police department, particularly like Oakland—I mean, any police department—but Oakland really has history of civil liberties abuses, mismanagement and it’s really not a solution to public safety problems in Oakland to be giving them this kind of technology. GOSZTOLA: I don’t know how much you can speak to this, but was there an issue with the Oakland city and whether they broke the law in going after a federally-funded mass surveillance contract? KAYYALI: I can speak a little bit to it. EFF has not focused on the specific contracting issues but Oakland does have an anti-nuclear ordinance. And there are concerns that—Actually, the first contract that the City Council signed they had to retract because the contractor was involved in nuclear weapons. So, this second contractor, SEIC, there is actually concerns about this company as well. The city of Oakland it’s not—This anti-nuclear ordinance restricts the city of Oakland from doing business with any company that has been involved in the production of nuclear weapons. There’s actually a citizens group that has threatened to sue over this violation of municipal code. GOSZTOLA: What about secrecy? I know there’s a group that was able to get there hands on some pages of documents related to what was happening. It looks like the California Public Records Act was used to find out what the city was planning. Is there anything particular that was found out or has it been so secretive it was hard to tell? KAYYALI: Well, I think there is definitely more we would have liked to know. There have also been some really interesting tidbits in those documents. One of the things that we’ve heard over and over again from city staff is that they’re doing the best to answer the city council’s questions. That they are just concerned with public safety and really emergencies in the city of Oakland and that there are no information sharing agreements with the federal government. These documents that we’ve been able to look at, and there have been—I don’t know if you’ve been able to take a look at them—There are hundreds of pages of emails and there are some really interesting conversations in them. There are conversations where representatives from different agencies are strategizing on how to avoid thoroughly answering Public Records Act requests. This is after they got some of the initial requests. There are conversations about trying to get fusion center funding. For those not familiar with fusion centers, these are local, state and information sharing collaborations that are certified by the Department of Homeland Security. So, the idea that would not be an information sharing agreement is patently false. Oakland is also part of a Joint Terrorism Task Force, and that inherently is going to allow information sharing between the OPD and the FBI. So again no reason to think there is not information sharing going on. The way in which the staff has discussed the concerns of the council and the concerns of the public is frankly insulting. This is a really good example of public engagement and public discussion and to see the city staff really not responding to questions, not being open to PRAs—I think it’s really problematic. That was one of the big reasons why we said, even if port security is an issue, you need to just vote “no” and just handle what’s already been built. Because I think it’s really a mistake to trust the city staff at this point. I think they have demonstrated that they’re not really interested in public engagement. GOSZTOLA: So, going forward, I guess first—Does the Electronic Frontier Foundation and other groups in Oakland, do they have concerned about what is still proposed around the Port of Oakland? Is there any continued work around this project? KAYYALI: Absolutely. You know, as much as we can provide information to the City Council when they are willing to listen to remaining concerns. We wrote two letters. In our second letter, I listed over twenty questions for the City Council to ask about the Domain Awareness Center. And those questions still haven’t been answered and I think the answers are still pertinent, and I hope the City Council is not gonna just give city staff free reign now that they’ve agreed to Phase Two, particularly considering that the cameras in the city are supposed to be removed. Even with the shrunken size, there’s still a lot of concerns and a lot more work that could be done. And so it’s very clear that even if it is port only now, there’s no reason it will stay that way. And Mayor Quan has made it clear that she intends to add in systems one at a time. So this is another situation where people just need to continue being vigilant. GOSZTOLA: So you’re saying there’s some hardware, such as cameras, already up in the city that was going to be a part of the system and now it’s up to activists to get those cameras removed? KAYYALI: Yeah. After coming to a lot of city council meetings—And, for anybody who’s never been to a city council meeting in Oakland where there’s a contentious issue being discussed, these meetings went until 1 or 2 in the morning. I’m really impressed with the people who worked on this. After all of these meetings, after all of the public pressure, finally, one of the city council members started asking really serious questions at the February 18 meeting and put it out for another two weeks, the final vote, and then at the final vote they agreed that they would take out the city cameras. So it is port only, however, it’s still going to include some information from the police department so actually think it’s not fair to say it’s port only. It’s just smaller in size. And, again, there’s no reason why these components aren’t going to be added in later. GOSZTOLA: These things have a way of metastasizing, as we’ve seen in other cities and other settings in the United States. The last question I have for you is if you would maybe take a moment to put this into context. I’m sure you pay attention to things that happen in other parts of the country, and I’m sure what’s happening in Oakland is not unique. Is there any larger point you want to make before we wrap up this discussion? KAYYALI: Absolutely. I would encourage every local activist who’s concerned about privacy to really pay attention to what their city government is doing, particularly in getting these sorts of grants. We hear a lot of about the NSA. Obviously, EFF is doing a lot of work on the NSA. We’re suing the NSA. And it’s a very real concern. That being said, it’s local police that people interact with day to day, and local police are getting Department of Homeland Security grants. So, I strongly encourage people to find out what your state public records act law is. Go and do PRAs about Department of Homeland Security grants that you’re city government might be seeking or your county government. And then go fight those grants when they’re trying to purchase this militarized software and hardware and when they’re trying to create a surveillance [hub] that’s run by the local law enforcement. GOSZTOLA: We appreciate you joining this show. I know you had a busy week at South by Southwest so we wish you the best of luck. And thanks again for joining.